What’s on Your Relationship Resume? Image. So much in our society revolves around how we look to others; our physical attractiveness, what clothes we wear, the type of cars we drive, the homes we live in, who our friends are, what we do for a living, and how much money we make. We place an inordinate amount of value on how others see us; so much so that we often begin to lose touch with who we really are as we strive to stay ahead in the image game. This sometimes spills over into how we arrive at conclusions about what we “should” have when it comes to relationships. What we have and what we do- our “resumes”- becomes the measurement by which we determine our worthiness. The flaw in the theory that we are our resumes, and that the “better” our resumes, the more worthy we are as mates, is that it causes us to miss out on a very fundamental truth about love and relationships. It isn’t what we do or what we have, but who we are BEING that better positions us to attract the love that we are seeking. When we get caught up in a story about who is worthy or unworthy of having a mate based upon looks, status and accomplishments, we push ourselves further and further away from the possibility of having authentic love. We also perpetuate the very thing that we often claim to despise-superficiality. When we begin to look inside of ourselves and focus on what really matters, we will come to a better understanding of what love is. We will no longer ask the question, “Why her and not me?” We will understand that with relationships, much like a job interview, the position isn’t necessarily filled by the candidate with the best resume; but by the one who is the best fit. 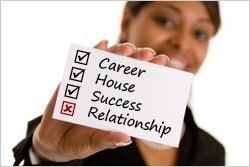 Reading: What’s on Your Relationship Resume?